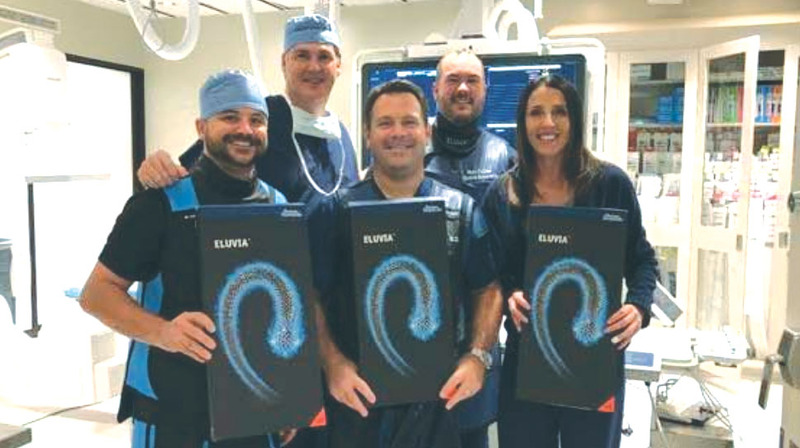 George Chrysant, M.D., an interventional cardiologist with INTEGRIS Heart Hospital in Oklahoma City, is the second in the country and first in the state to utilize the Eluvia™ Drug-Eluting Vascular Stent System. He completed the state’s inaugural implant at INTEGRIS Baptist Medical Center on Oct. 5. The therapy received U.S. FDA approval on Sept. 18. The Eluvia™ Drug-Eluting Vascular Stent System is specifically developed for the treatment of peripheral artery disease (PAD). Approximately 8.5 million people in the United States are affected by PAD, which occurs when fatty or calcified atherosclerotic material, called plaque, builds up on the walls of the arteries of the legs, restricting blood flow and causing pain, swelling and a diminished quality of life. If blood flow is not restored and maintained, severe cases of PAD can lead to pain, ulcers and even amputation of the affected limb. The Eluvia stent utilizes a drug-polymer combination to offer sustained release of the drug paclitaxel for a one-year timeframe, designed to prevent tissue regrowth that might otherwise block the stented artery. The Eluvia Stent has been commercially available in select countries since 2016 with exceptional outcomes.